A major chapter in the history of medicine has been written by UC San Francisco. They are writing the next for precision medicine. Keith Yamamoto is in both chapters. Since the 1970s, he has been a researcher of cellular and molecular biology at UCSF and now serves as Vice Chancellor of Science Policy and Strategy as well. His career has always had these two parallel tracks of scientist and policy administrator. He has sat on various review boards at the NIH and chaired the Board of Life Sciences at the National Academy of Sciences where he worked with a group that would stimulate President Obama to launch his Precision Medicine Initiative (PMI) back in 2015. Today he shares with us what that was like for him. Though the political wind blows a different direction at the national level these days, the momentum continues for the PMI at NIH, funded, as Keith points out, by congress with the Faster Cures bill for ten years. And at UCSF? They are just getting started in precision medicine. With an illustrious history in medicine, an enviable location at the tech hub of the world, and resourced to the gills—the university can boast its sixth year in a row of being the top recipient of NIH funds, and rides around the top of the list for private contributions--UCSF is also one of the hosting universities for California’s own Precision Medicine Initiative, which just a few days ago received a huge boost from Governor Brown's new budget. What is the university doing with all this gold? 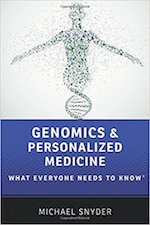 Keith says UCSF is building a machine, a precision medicine platform, that brings together data from all the disparate places we’ve talked about here on the program—the omics data, wearables information, electronic health records, etc—into an information commons similar to Google Maps, creating a "knowledge network." It’s a story we’re all familiar with, and if anyone can do it, certainly this is the place. In addition, Keith describes one of the many collaborations UCSF is involved in called ATOM, or Accelerating Therapeutics for Opportunities in Medicine, a public-private consortium that brings the idea of big data sharing to drug discovery at the pre competitive level. “What we’re moving is the starting line, rather than the finish line", says Keith. The NIH has spearheaded similar efforts before. Perhaps with UCSF’s star computer science power this effort will go new places. For those in our audience attending next week’s Precision Medicine World Conference in Silicon Valley, you can hear Keith talk on Accelerating Cancer Therapies and Exploiting Longitudinal Patient Data: Partnering to Achieve Precision Medicine. This week Charlie Rose interviewed the robot Sophia for CBS. We've come up with the following questions for the famous computer, Watson. Just two years at their new home in Silicon Valley and not far down the road from 23andMe, the San Francisco 49ers are offering their fans genetic testing and the chance to donate blood to advance human genome research. In a keynote talk this week for the online Genetics and Genomics conference, computational biology whiz, John Quackenbush, listed some pretty wild correlations found by a Harvard Business School student when he mixed some large data sets. For example, U.S. spending on science, space, and technology corresponds directly with suicides by hanging, strangulation and suffocation. We never would have guessed it without the help of big data. Are these spurious correlations the reason that Quackenbush has taken up boxing? It's the old fashioned methodology: bang some new relevant correlations into the head. And finally, we reluctantly come up with several reasons why aging scientists should retire. There is no mandatory retirement age in the U.S. and younger researchers are understandably feeling neglected by the NIH. Numbers show that NIH funding awarded to researchers over 65 has doubled since 1998. And a new plan by the NIH to come up with "emeritus" grants encouraging researchers to wind things down just isn't taking off. What to do, what to do? Enjoy our weekly wrap on life science news. In our new show format, host Theral Timpson engages three guests in some lively discussion about January's hottest biotech news. Big Data might offer tremendous breakthroughs in healthcare and personalized medicine. But with the new amounts of terabytes and petabytes flooding organizations today, old architectures aren't able to keep up. Take the genome, for instance. We know that there is a ton of valuable information in there. But how does one go about looking at it? Doctors have very little time as it is, and decision making becomes a burden becuase it takes days to get answers to questions, if at all. And what about the opportunity to get genomic data to the lay person as 23andMe was doing?